Kanani is a professional Polynesian dancer based out of Southern California. She is currently the Lead Instructor at her family dance studio, Lokelani’s Rhythm of the Islands. Kanani is a multi-award winning Tahitian soloist, including titles at Heiva I Paris 2018 Top Vahine and ‘Ori Tahiti World Cup 2nd place. Kanani has had the opportunity to travel the world as a both a dancer and choreographer. She has been to Japan, Tahiti, Europe, and all throughout the United States. Her goal as a young Polynesian Woman is to lead by example. Kanani strongly believes in “reaching for the stars…” and working everyday to achieve your best life. She uses Dance as a way to communicate with the world and provide a safe place for others to open their hearts and minds. This is Kanani Lokelani Asuega. Mira Clutter is originally from Seattle, WA and began her dance journey in high school as an officer for their competitive dance team. At the age of 24, she was encouraged by the late renowned Kumu Hula, Auntie Marge Lehualani Hunt, to dance hula and under her Kumu lineage she learned traditional ‘auana and kahiko style dance with Kumu Krista Moanike’alanalehua Espiritu of Hula O’ Lehualani. After moving to Huntington Beach, CA, she wanted to continue and expand her knowledge of Polynesian dance and joined Lokelani’s Rhythm of the Islands in 2009. Mira is now one of Lokelani’s lead dancers, a showgirl with their entertainment group, and the beginner Tahitian/Hula instructor for the Keiki, Teen, and Adult classes. Mira graduated from Washington State University with a BA in Communications and when she’s not making you sweat during class, she works full-time as a Senior Architectural Rep for Daltile. She enjoys spending the little extra time she has at the ballet studio, and with her husband, Travis, and their small village of cats in Huntington Beach. Lona Manu Pacheco was born and raised in Yokohama, Japan. Her mother is Japanese and her father is Hawaiian from the Big Island. She is married and has two beautiful children. She studied Japanese dance as a child, and went on to competitive high school gymnastics, cheerleading, and college dance courses. After graduating from California State University Long Beach with Special Education and Vocational Specialist teaching credentials, she started her teaching career at Ocean View High School in Huntington Beach. She recently retired after teaching for 34 years. Eighteen years ago she began learning hula with Lokelani’s Rhythm of the Islands under Kumu Florence Kuuleilokelani Kahaanui Brodrick and her daughter Kathy Lokelani Kahaanui Asuega. She is currently one of the Alaka’i for Lokelani’s hula classes. 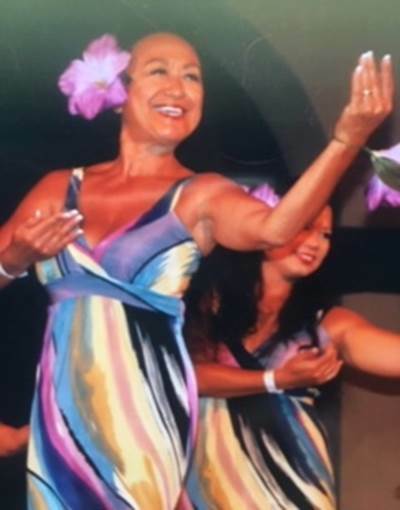 For the past five years she has been teaching the adult hula classes and assisting with the advanced hula class. She continues to play ukulele and study the Hawaiian culture, including the lineage of the Beamer family with support from Kumu Hulali Solomon Beamer from the Big Island. During her free time, she routinely travels to Japan and Hawaii with her family. Kayley Dykman, 18, is currently a senior who will be graduating from Fountain Valley High School in June of 2019. She began dancing at the age of 4 and shortly after joined Lokelani’s under the instruction of Kathy and Roy. She quickly became a showgirl, one of their lead dancers, and always loves traveling, performing, and competing with ROTI. Kayley teaches our youngest dancers and often assists other instructors with their classes. You can almost always catch her at the studio early or just hanging around snacking. She will be studying at Laguna College of Art and Design come Fall of 2019, but has no plans of leaving the studio just yet! Keanie Northrop was born and raised in Southern California. Her dance voyage began in elementary school at the age of 10 with Lokelani's Rhythm of the Islands. Throughout the years she became a lead dancer, a showgirl, and wanted to help spread the knowledge of Polynesian dance beginning at the age of 17. Keanie currently teaches our junior/pre-teen classes and assists her fellow instructors in class when needed. Prior to taking a break to bear her children, she competed and placed in multiple competitions. She is a mother of two beautiful children, Kalina and Ky-Mani, who dance as well. When she's not pushing our dancers to their limits in the studio, she loves spending time with her kids and life partner, Manny. Keanie is a Musculoskeletal Ultrasound Technician and has returned back to school attending Los Angeles Harbor College to expand her knowledge in the medical field; but she doesn't plan on leaving her second home anytime soon! Alli Zamora joined Lokelani’s at the age of 6 and has continued to dance with the studio since then. At the age of 7, she began to dance competitively which increased her passion for Polynesian dancing. Alli is an award winning soloist who loves to travel and learn from others. She enjoys being a showgirl, a lead dancer, and spreading her love for Ori! She is inspired by other styles of dancing and seeing others have the same passion for dance as she does. She attended high school at the Orange County School of the Arts with a focus on musical Theatre. After Graduating In 2018, she decided to merge her passion with her education and is currently attending Orange Coast College working towards a bachelors in international dance.